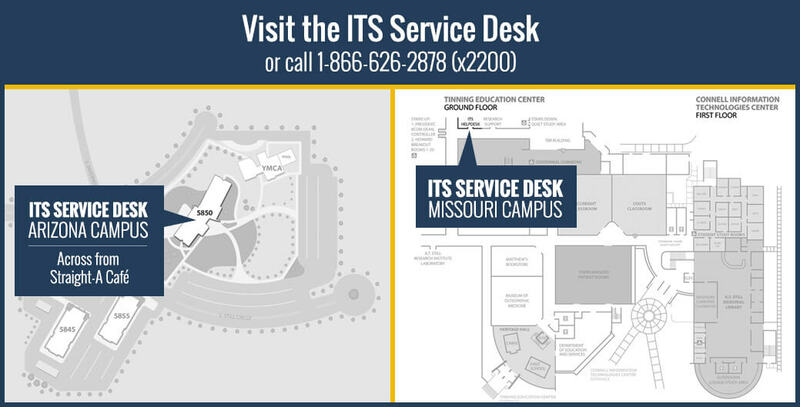 The Help Desk group is the central point of contact for problems and questions concerning technology at ATSU. Support staff will make every effort to resolve your problems or answer questions. When appropriate, your issue may be assigned to another group for resolution. In-house technicians are available to assist during business hours and our out-sourced call center will assist you, evenings, weekends and holidays. There are over 100 various software applications and related services used on campus. ITS tries to maintain links to helpful support and maintenance areas related to these tools. If you have questions about, or need to report a possible security breach, phishing attempt or suspected SPAM, ITS provides a simple effective solution. Simply forward the suspect email(s) or your questions to: reportabuse@atsu.edu. The question or information will go directly to a member of the ITS security team. One of the team members will investigate the issue and you will have an answer back within one business day. If the security team determines that you have received a SPAM email, it is a good idea to report it to Google. All you have to do is click the report SPAM button at the top of the suspect email. Here’s what the Report SPAM icon looks like. Security services include a variety of services to protect people, property (especially technology assets), and data. The security of all machines and data on the ATSU network depends on every account and machine being secure and free of malware such as viruses, worms and spyware. A single insecure account or machine can cause a major security incident or cause a virus attack to be propagated. Many computer security incidents are preventable by a combination of keeping machines up to date, utilizing ATSU provided anti-virus protection and having strong passwords on all accounts in addition to safe browsing habits. Classrooms and conference rooms can contain a lot of technology. ITS provides support throughout the entire lifecycle of these rooms. Whether it’s design advice, making certain the projectors and microphones are in proper working order, or just finding where a room is located, this area will help. ATSU hosts many events each year that are not only interesting but can be life markers, such as white coat ceremonies and commencement. ITS captures these events and more. In order to provide access for those who missed the live occasion, the link below will take you to our bank of recent recordings. Also, please notice on this ITS Service page how you can request special event capture and recording under the audio/video capture and recording section. The network group manages network accounts, how to connect to printers around campus, and using the wireless network. ATSU has partnered with Google to provide our faculty, staff and students tools to enhance communication and collaboration. Please note that new services are added frequently, so check back often for new offerings. Your ATSU login and password will take you to all the Google Apps listed to the left. Note that you will need a separate password provided by the Help Desk to access Gmail and Calendaring via a mobile device. ITS provides a wide array of services related to the electronic capture and distribution of Audio and Video. Electronic capture, recording, and real-time sharing of classroom and meeting events can be accomplished in a variety of ways. Whether your goal is to add some flash video to your course content or simply connect with a colleague across campus, ITS can help you. Taking a look at this section will help guide you toward what services what might work best. The Academic Technologies group provides a variety of signage and graphic design services including digital signage and research poster preparations. The Support Center team supports the full lifecycle of ATSU computer equipment. This includes purchasing of new computers, routine replacement of outdated equipment, maintenance on existing equipment and disposal of equipment at end of life. Find out how to connect to printers and copy machines around campus. The ATSU Portal is the main gateway for accessing many of the online resources at ATSU. The portal enables faculty, staff and students to access their most frequently used online resources and web sites from one central place. The portal also automates login procedures to other University resources, making it easier to access infrequently used resources without the need to remember additional UserIDs or Password.